Most scientists agree secondhand smoke is bad for young lungs, but a new study shows it may also be going to the heads of adolescents. More precisely: their ears. 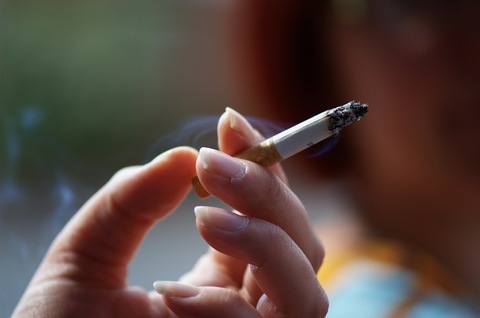 Teens who breathe in secondhand smoke are nearly twice as likely to show signs of low-frequency hearing loss, according to a study released Monday and published in the journal Archives of Otolaryngology – Head and Neck Surgery. And the more they’re exposed to the smoke, the worse the hearing loss becomes. The report is the first to link secondhand smoke with long-term hearing loss, said Dr. Anil K. Lalwani, a professor of otolaryngology and pediatrics at the NYU Langone Medical Center. Previous studies have shown that children exposed to secondhand smoke are prone to more frequent bouts of otitis media — an infection in the middle ear that normally clears up without long-term damage. “But our study found an effect that occurs in the inner ear and is irreversible,” Lalwani said. Unlike ear infections caused by smoke flowing directly into the ear, the findings indicate that chemicals within smoke may be damaging the inner ear directly, he noted. While additional research needs to be conducted, the condition could be caused when smoke is ingested and makes its way to the blood supply flowing to the inner ear or receptors in the central nervous system, he said. Lalwani and his colleagues examined 1,533 nonsmoking adolescents ranging from 12 years to 19 who participated in the National Health and Nutrition Examination Survey from 2005 to 2006. The participants were interviewed about their health status and family history, exposure to secondhand smoke and self-recognition of hearing trouble. That was followed with a hearing test and blood test, which detected their level of cotinine – a byproduct of nicotine and a reliable indicator of exposure to secondhand smoke. The more cotinine in their blood, the higher the risk of hearing trouble, the study found. Just as troubling is the fact that more than 80 percent of those identified to have a hearing problem didn’t realize anything was wrong, Lalwani said.